These dainty flip flops are from Beautiful Soles Inc., a social business enterprise put up by a group of students from the Ateneo, that works in collaboration with Gawad Kalinga Molave Village. Known for their Bejeweled Slippers, each jewel-encrusted pair is hand-sewn by the mothers of Gawad Kalinga Molave Village. A portion of the profits goes to the community, so every purchase is a drop in the bucket towards empowering the women and encouraging them to be self-sufficient! 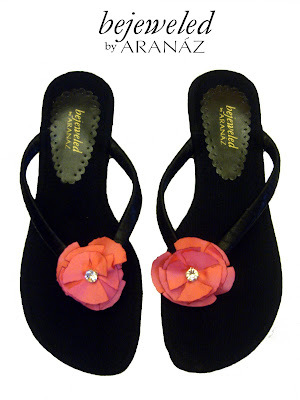 The group has already released several collections of embellished slippers in the past, the latest to date being Bejeweled by ARANÁZ. 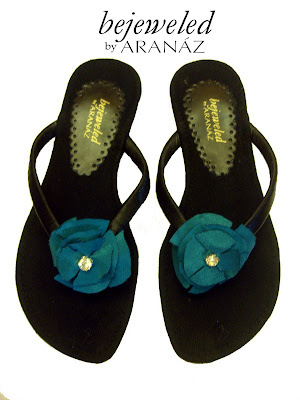 Designer Amina Aranaz used her signature Petalia style with the satin petals and placed a rhinestone in the middle to give the slippers that bejeweled flair. The collection was launched at the Supersale Bazaar in Essensa last May 16, 2009, and is now available at ARANÁZ stores in Greenbelt 5 and Powerplant Mall for Php700 a pair. To know more about this project, please check out the Bejeweled Slippers website and be dazzled by what you can get from supporting a worthy cause!